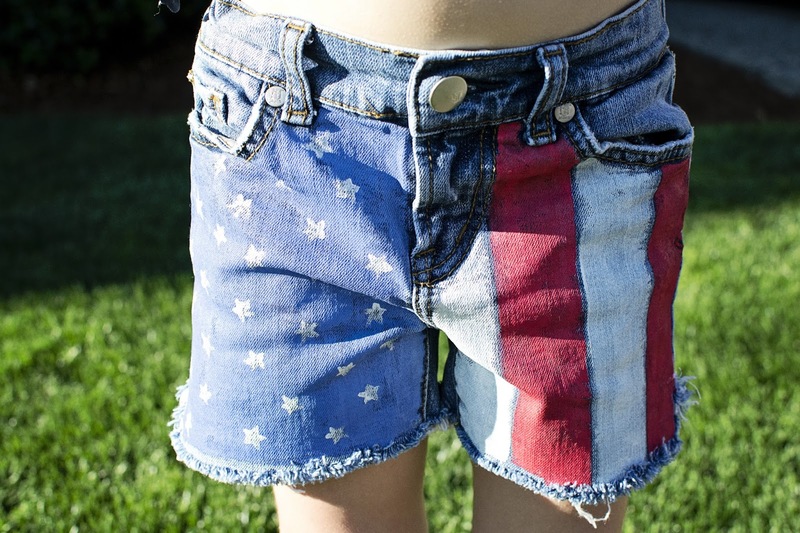 while it rains: diy flag shorts! 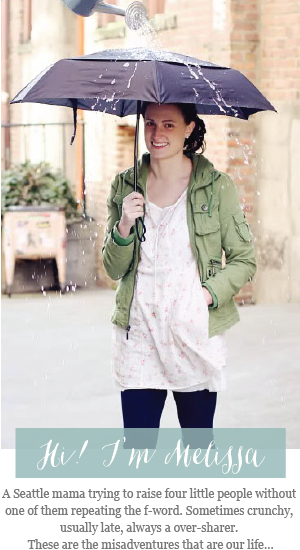 whew, so glad we finally get to have a fourth of july where my kids aren't decked head to toe in old navy! 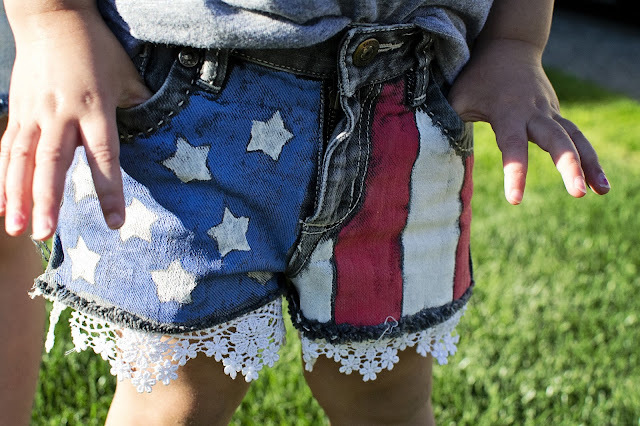 this was the easiest project to tackle and i can't wait to hear all of the ohs and awes over how adorable the girls are in their festive cut-offs. a old pair of jeans you are of with cutting up! step one: i eyed a pair of cut-offs that rowan already had for ideas on where and how to cut the jeans. one thing you want to watch is to have the front waist lower then the back, not even, when measuring and cutting (like how the pair on the left is laying in the photo above). i decided on the length i wanted (just below the crotch), folded the pair length wise, held them down firm with a yard stick and made my cut with a rotary cutter. i also added a slit on each side and hemmed that up with my machine so it wouldn't pull anymore and to hide that raw edge. then, i washed and dried them. step two: i took some time to clean up the messy edges then drew my stripes on using the width of a ruler i had on hand and a pen. i chose not to go right up the edges with the paint for a neat effect but sky's the limit with how you want to do it! i almost even did the second pair with horizontal stripes then got distracted and made them the same, whoops. step three: for rowans i laid down tons of little star stickers, dabbed the blue on with a foam brush, then used tweezers to remove the stickers, finally using a tiny brush to fill in the stars with white. for stella's, i used a stencil and dabbed the white stars on first, then used a smaller brush to fill in the blue around. you could do without both and eye the stars if you prefer! step four: i played around with different placing of the lace, finally settling on the two choices above. on stella's, around the inside, i decided to leave a slit so that she wouldn't be restricted as she ran and played on thursday. i half glues, half sticked the lace into place and then heat set in my paint with a towel between the shorts and iron. there were so much fun inspiration on pinterest that i really could make a million more pairs of these. maybe i need some? let me know if you try this out - i would love to see the finished product! These are awesome! 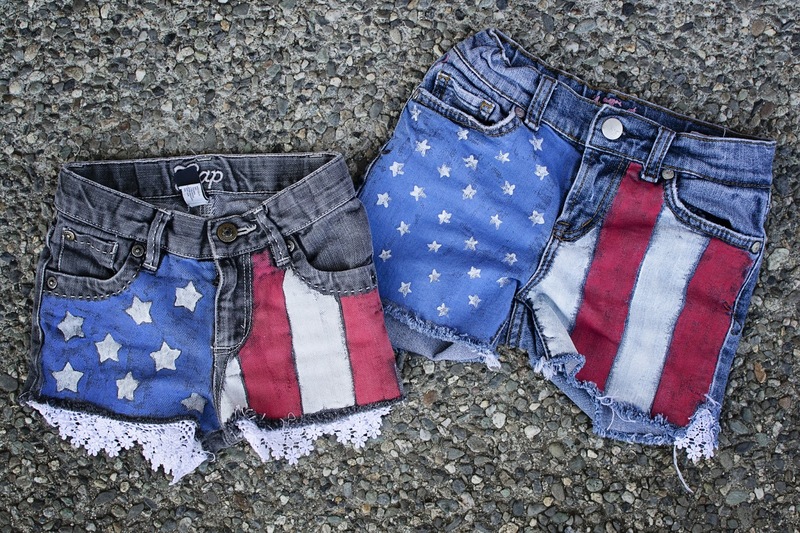 I'm not even American and I want to make a pair!! Love these! I'd wear them all summer long!